I have said it before we love soup at our house. But I must confess, I am a bit of a soup snob. I like homemade soup. I don’t like canned soup, I don’t like soup from the frozen food section, and I don’t like soup from a package. Although I must say that recently when I was sick, my husband made me a bowl of Campbell’s Chicken with Rice soup that tasted like manna from heaven! But suffice it to say, when not on my death bed I prefer homemade soup. I think folks shy away from making homemade soup because they think it’s an all day task. I am here to tell you it doesn’t have to be. One of the best ways to save time with soup making is to buy the soup stock. When I have time, I like to make my own, but often I rely on a good quality store-bought low sodium chicken or beef stock. The one thing to be careful with is the sodium content of store-bought stocks and soups. With a good soup you don’t need to rely on salt for flavor. Same holds true for a good stock. Start with leeks. 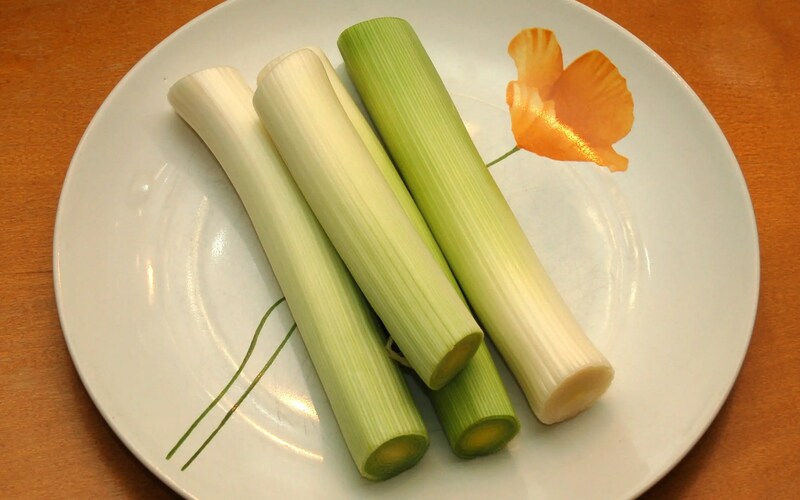 Be sure to use only white and light green parts of the leek for best flavor. In a sauté pan, heat olive oil and add leeks, onions and celery. Meanwhile, in a large pot add the Chicken Stock, cubed Potatoes and Ham, and simmer. 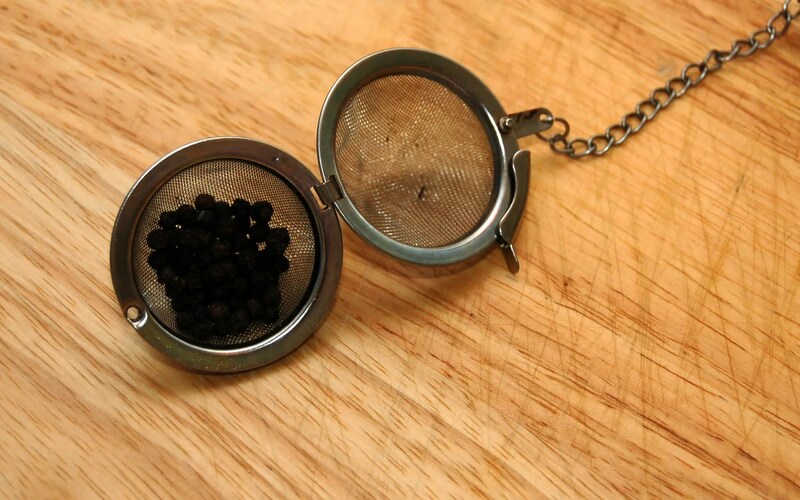 Here’s a good soup tip: When I’m adding pepper to light colored soup and I don’t want to see black flecks of pepper, I will put about 8 peppercorns in a tea strainer and put it in the pot. Here’s reality: I am not usually that picky and just add in some freshly ground pepper. I have been making variations of this Leek and Potato soup for years. Recently I started pureeing the leek and onion mixture before adding it to the potatoes and ham. The pureed veggies give the soup an almost creamy texture and a nice body. Everyone likes a nice body, don’t they? I also find that pureeing the veggies makes it easier to omit the cream without missing it too much. If you like you can just make the soup without pureeing the veggies for a more rustic look and texture. Use caution when blending hot soup, it can burst out of the blender like a volcano. I only fill the blender about 1/3 at a time and I use oven mitts to hold the lid of the blender on. It’s that easy to have a delicious homemade bowl of soup! The pureed veggies give the soup an almost creamy texture and a nice body. Yield: 6-8 good sized servings. 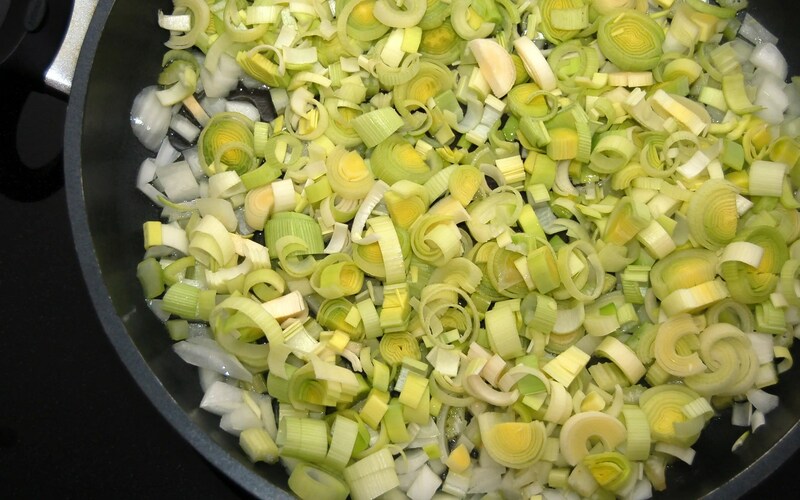 In a sauté pan, heat olive oil and add leeks, onions and celery – cook until very soft about 15 minutes. Do not brown. 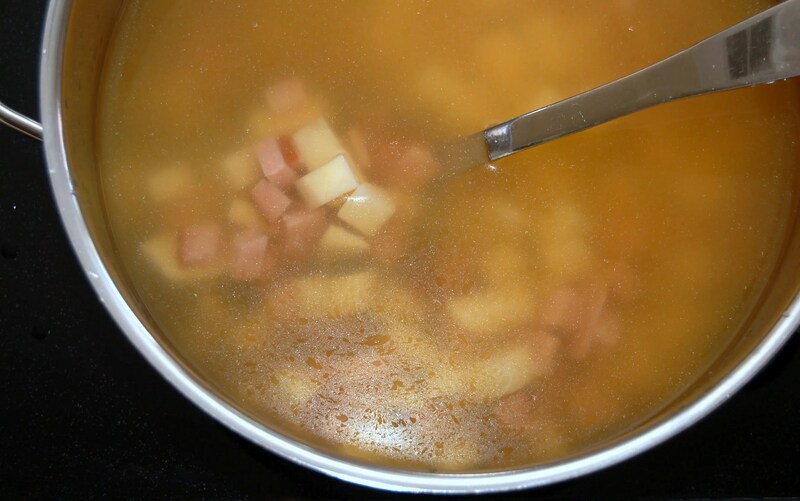 Meanwhile in a large pot add the Chicken Stock, cubed Potatoes and Ham, and simmer. 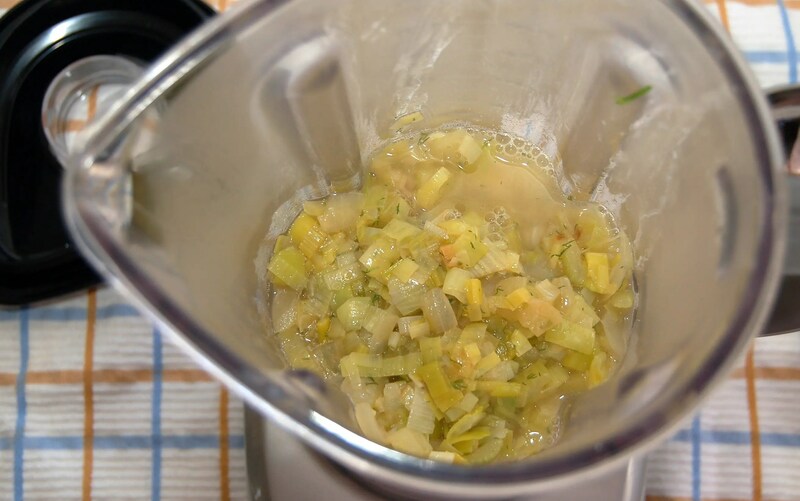 When leek mixture is soft, puree in a blender using a bit of the chicken stock to ensure it blends smoothly. Just remember use caution when blending hot mixtures in the blender. Do it in small batches so the steam doesn’t build up and make a mess – or even worse, burn you. When smooth, add the leek mixture to the pot of potatoes and ham. Simmer the potato, ham, and leek mixture until potatoes are cooked. Add in dill. Now at this point I suggest you taste your soup. Add salt and pepper as necessary. You just may like it as is without adding the cream and sour cream, which is great if you want to save the fat and calories. If you decided to go with the creams, add them last. Don’t let the soup come to a boiling point once you add the cream, or the cream may curdle. This soup will taste great when served right away, but if you have the time, chill in the fridge overnight (don’t add in the creams) to let the flavor develop even more. Out of the fridge, warm soup, add cream and serve! 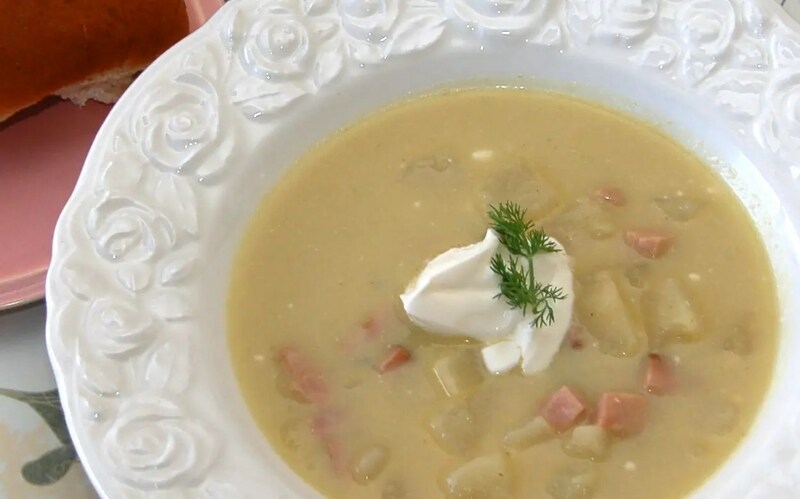 *Variation – This soup is great to make if you have a leftover ham bone. Just boil the bone with peppercorns in about 2.5 quarts of water for about 30 minutes, then simmer with the 2 cups of ham for about another hour. Remove the ham bone, then add in the potatoes and continue with the recipe as directed.